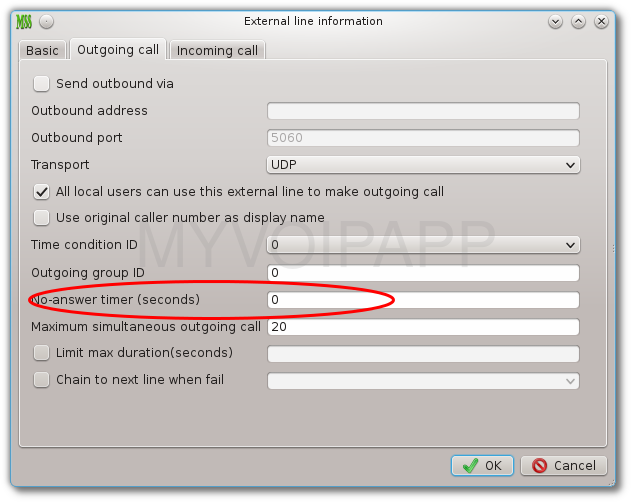 In the external line “outgoing calls” configuration, we add an item “no-answer timer”. This item is used to limit the no-answer timer value when make outgoing calls. Please refer to attached figure. No-answer timer vaule in outgoing calls of external line. By default, its value is zero that means the line will use system default no-answer timer value. If it is set a value, the line will use it firstly. For example, if it is set to be “15”, then the line will force to release the call in 15 seconds if peer side doesn’t answer the call. Sometimes, we need limit the call right of some extensions. For example, we want to limit only specific extensions can make out-group calls to outsides, others can only make calls between extensions. In MSS, we use “call level” feature to do it. By default, we don’t assign “call level” to any called number prefix in “analyze called number” table. That means all extensions can have the same right. To limit extensions, we should indicatedifferent “call level” to the called number prefix and assign relative “call level” right to special extensions, then they will have the right to make such calls. For example, the default out-group call prefix is “9”. Please click menu “Dial plan / Analyze called number” and edit or add a record whose prefix is “9” and route type is “external line”. In this configuration, we can select “call level 1” to this prefix “9”. Then, please click menu “data / local users” and edit or add a local user. In the pop-up dialog, please click “Basic Call” tab and enable “Call level 1” to this extension. After that, the extension has the “call level 1” right to make calls to outside by dialing “9xxxxx”. For others, since they don’t have “call level 1” right, their calls will be rejected when they dial “9xxxxx”.